So I must admit, I haven’t posted here in awhile because I just went through the most challenging subjects I’ve done to date. Those who are mathematically minded will probably think I’m being a wuss, but I found myself having to study more to understand different aspects of statistics, a new software system to complete our assignments based on statistical methods and endure a Friday evening class of statistics. It feels like all I’ve been doing is eating, breathing and dreaming about statistics. Despite feeling overwhelmed with my constant travels between university and home, I did manage to get out and experience new things. 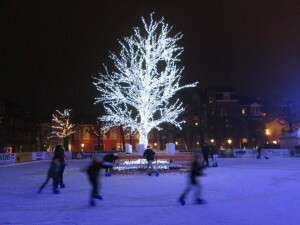 Maastricht recently opened up their Christmas markets and it looks like something from a movie, it is full of good food, Christmas trinkets and an ice-skating rink! Needless to say, watching the city transform in to a festive hub has been truly remarkable. 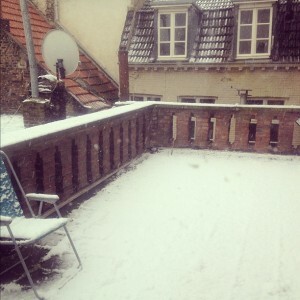 We also received snow due to a cold snap we had two weeks ago, but unfortunately it melted. A student who will be visiting QUT under the same program as I’m in gave me some good advice when it comes to riding through the snow – “the kids here are crazy and ride their bikes up the gutters, so be careful when riding that you don’t get caught in their tracks and stack it up the gutter”. So , for the few days we had snow, I rode with absolute precision. Now, exams and coursework are over, meaning most of the friends I have made here are travelling back home or moving on to grander things. Only a few will be around for a short two-week skills block in January, so the goodbye process is extremely drawn out. I’ll be kicking off my three week tour around Germany, UK and France tomorrow, so with the sadness of saying goodbye to a lot of interesting and fun people comes a sense of excitement of what is to come. In parting, I’ll say Merry Christmas, have a safe new year and enjoy that sun! For the last few weeks there has been a lot of speculation about when the first snow of the season would fall here. Lille is not a very snowy area – something about the geography – but we’d all been hearing reports from our friends in other European universities that the snows had begun. But last night, only a few days after the rest of Europe, the weather finally cooperated and I woke up this morning to see these scenes from my window. I live on campus and it just so happens that my little studio apartment was positioned to get some great views. I could go outside to take photos but it’s FREEZING. At this point in the semester I am very glad I chose to live on campus as my accommodation. Not just because I can see snow on frosty mornings like today, but also because the campus is about a 25min tram ride outside of the main city. Because classes run from 9:40am – 5:20pm (depending on the subject and day) it means I save a lot of time in transit. It also means the occasional 8am start isn’t too painful as the classroom building is about a one minute walk away from my accommodation. The rent for campus accommodation is a little higher than renting a room in a share apartment, but my little studio does come furnished with a bed, two tables, two chairs, a kitchenette (fridge, sink, microwave and two hot plates) and a decent sized bathroom (shower, sink and toilet). A cleaning lady also comes in twice a month to clean my studio and breakfast is provided on weekdays. So although it’s a little more expensive, the location and other perks make up for it in my books. Then again, the last tram on most nights is 12:15am so if you want to go drinking in Lille with your classmates you are a bit of a Cinderella.